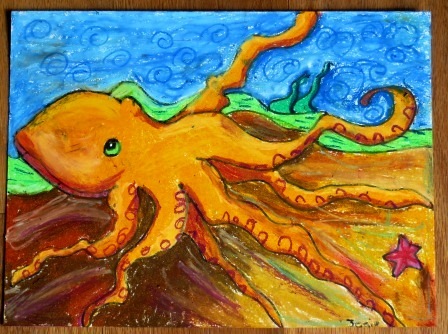 This entry was posted in Art and tagged art, childrens art, squid, thrive online art school. Bookmark the permalink. Ultra-cool octopus, Jojofett! I used to love working with oil pastels — glad to see you’re enjoying them, too! (Although you’re right, they are messy!) Well done! I love it JoJo! 😀 It’s a nice octopus! Looks even better finished! Uncle Dave loves it too. Awesome job. 🙂 Thank you Aunt Char Char. 🙂 Tell Uncle Dave thank you too! Hi Josie! It’s so fun to see your octopus art! You did an amazing job layering those pastels. Wonderful detail. It is amazing and life like. Great work Josie. You have a great talent. Josie – your octopus is beautiful! Oil pastels do get messy, don’t they? I enjoy the vibrant colors of oil pastels. You did a great job blending so many colors. Seriously, beautiful art!